i-rest by GIA Wellness is a Dietary Sleep Support Supplement containing a unique liquid blend of Melatonin and 7 other all-natural sleep assisting ingredients, all of them renowned for their sleep support qualities. According to the Center for Disease Control and Prevention, studies show that in the U.S. alone, an estimated 50-70 million adults suffer from sleep (or wakefulness) disorders. The National Sleep Foundation suggests that adults need 7 to 9 hours of sleep every night. Studies show that people with insufficient sleep are at higher risk for a number of health problems and diseases according to the Division of Sleep Medicine at Harvard Medical School. Meet i-Rest by GIA Wellness – a unique, super-liquid combination of Melatonin and 7 other all-natural sleep assisting ingredients, all of them renowned for their sleep support qualities. i-Rest is not only delivered in a highly absorbable fashion thanks to the combination of GIA’s proprietary Single-File Alignment (SFA) and ERT technologies, it also features a soothing Chamomile-Lemon flavor. So if you’re looking forward to falling asleep faster and reducing those nighttime awakenings, then you’ll love having i-Rest as your sleep-time companion. Melatonin is a hormone produced by the pineal gland in the brain that helps maintain the body’s circadian rhythm, or internal clock, which controls your sleep and wake cycles. Melatonin is commonly used to address sleep disturbance and insomnia. Valerian Root is an herb known for its sedative properties, and is used to ease insomnia and stress. Skullcap is a powerful medicinal herb that is used to help calm nerves and to address a variety of nervous issues such as sleeplessness and anxiety. L-Tryptophan is an essential amino acid. Our bodies can’t produce it so it must be acquired from food or in supplement form. L-Tryptophan is critical in the natural production of serotonin, which is known to help regulate mood, appetite, and sleep. 5-HTP increases the levels of serotonin in the brain which is responsible for mood, hunger and sleep. Serotonin helps to carry messages from one area of the brain to another. Hops are used in herbal remedies to exert a sedative effect on your central nervous system, thereby reducing locomotor activity and body temperature, while promoting sleep. Passion Flower is used as a calming herb to help address insomnia and anxiety. Scientists believe passionflower increases levels of a chemical in the brain called gamma aminobutyric acid (GABA), which lowers the activity of nerve cells, making people feel more calm and relaxed. Chamomile is an herb often used as a sleep aid. It contains glycine, an amino acid, known to relax nerves and thereby helping people sleep more soundly. For use as a dietary sleep support supplement, take 1mL (9 sprays orally, under the tongue) 20-30 minutes before bedtime. Shake well before each use! Caution: Do not drive or operate heavy machinery until you determine how this product will affect you. If you are taking prescription medication or have a medical condition, are pregnant or lactating, consult your physician before taking i-Rest. Keep out of reach of children. Store in cool, dry place. I often I wake up in the middle of the night and then have trouble going back to sleep. After waking up yet again at 4AM the other night, I sprayed the GIA ‘i-rest’ under my tongue and literally felt myself ‘melt’ back to sleep within 10 minutes, where usually I would toss and turn for hours. This product is amazing! I’ve been going through a lot of stress lately and have had a hard time falling asleep for months. I often lay in bed for 2 hours before I am actually able to doze off. Recently I used the ‘i-rest’ for the first time and I couldn’t believe how fast I fell asleep. It was the most relaxing and rejuvenating sleep I’ve had in months. 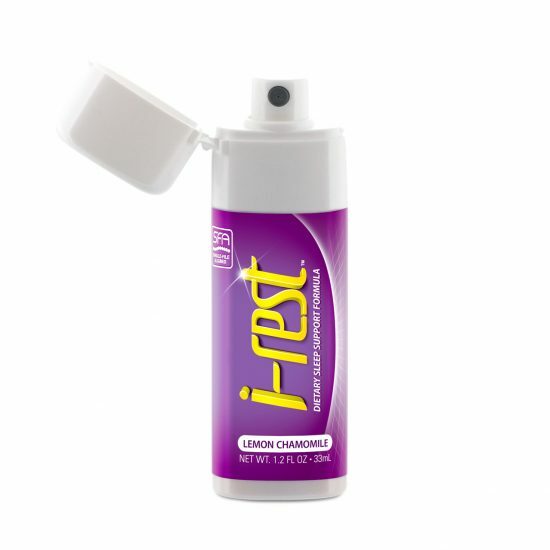 The first time I came across ‘GIA i-rest’, I used only 6 of the 9 sprays, just to try it. About half an hour later I could already feel my body relaxing and my eyes getting heavy. I had to go to a dinner shortly after trying it and could barely keep my eyes open. All I wanted to do was sleep. Once I got home I fell asleep quickly and slept great. What a product! I tried GIA i-rest for the first time while I was at the office, not realizing that it would take effect so quickly. I immediately felt relaxed and began to feel very sleepy. I literally had to keep spraying water on my face so that I could stay alert. As soon as I got home from work that day, I went to bed and had one of my best nights of sleep ever.